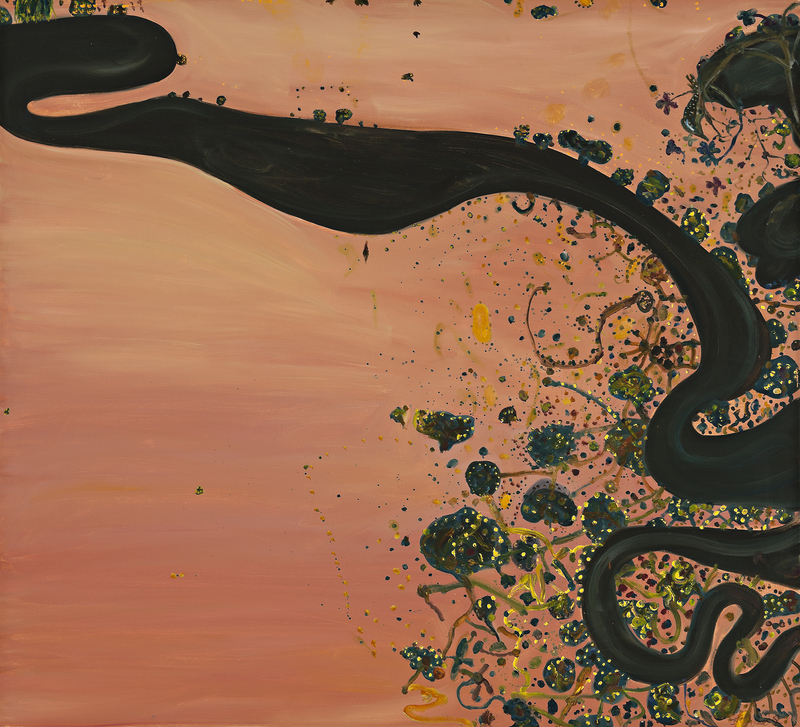 In the retrospective exhibition currently showing at the Art Gallery of New South Wales, Sydney, John Olsen is hailed as Australia’s greatest living artist. With a career that has spanned more than seven decades and witnessed the production of a large oeuvre of paintings, drawings and works in other media that present a vivid and unique interpretation of the Australian landscape, it is a well-deserved accolade. Painted in 1982, River and Wattle is a landscape that reveals an artist at the height of his powers. While the ground of the painting is rendered in oil, the effect is delicate, the usual opacity of the medium replaced with subtle brushwork and tonal variations that enliven the surface. The river is viewed from above, a dark, solid but sinuous form meandering across the canvas and creating the illusion of vast space. This bird’s eye view is combined with the close-up study of plant, insect and bird life depicted in a riotous jumble of lines, dots and patterns. Vivid yellow dots describe the springtime wattle and amidst the conglomeration of abstract forms and gestural marks that make up this image, a bird in its nest in the top right-hand corner is a delightful detail. In this brilliant merging of the monumental and the miniature, River and Wattle also reflects the experience of Olsen’s extensive journeys through remote parts of Australia during the 1970s – in particular his visit to Lake Eyre in 1974 – during which he was able to fully comprehend the complexity of the natural world, understanding it as both a physical structure as well as a diverse habitat 3, and expanding his ability to describe this totality in visual terms.